With this bilingual volume, the Institute of Modern Greek Studies is pleased to inaugurate a series of publications entitled “Greek language: synchrony and diachrony”, which will cover the following three areas: (a) the etymology of Greek, (b) language contact, (c) the koine/standard language and related issues. 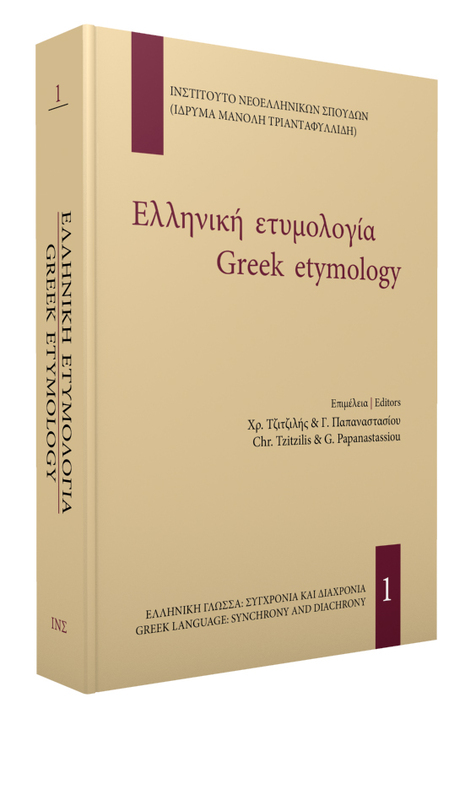 More specifically, this first volume includes 23 papers, most of which were presented at the 1st International Conference on the Etymology of the Greek Language (Ancient, Medieval and Modern), which was organized by the Institute on the 5th and 6th November 2015, at the Teloglion Fine Arts Foundation of the Aristotle University of Thessaloniki. The aim of this conference, and of the planned future conferences on the same subject, is to investigate theoretical and practical issues associated with the etymology of the Greek language, in all its periods and forms, dialect and otherwise, and also to investigate similar issues that concern the wider Balkan area, with the emphasis on the etymological investigation of Greek elements in the other Balkan (and other) languages. In addition, it aims to present specific etymological proposals for Ancient, Medieval, and Modern Greek words.